Place the garlic, onion and olive oil in a large saucepan over medium-high heat. 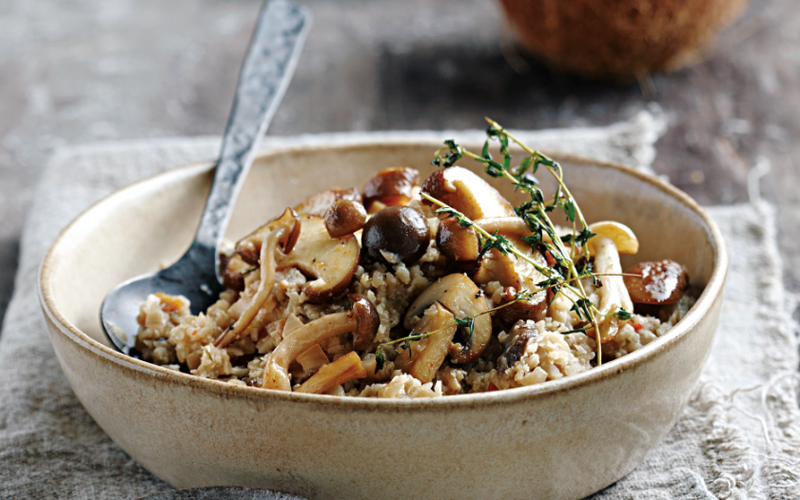 Cook for five minutes until fragrant, then add the mushrooms and sauté for another five minutes. Add the cauli rice, 3/4 cup wine and vegetable stock. Add a little more wine or water if necessary, to cover the veg. Stir in the chilli flakes and add the thyme stalks. Cook for 20 minutes, stirring occasionally, until the moisture is absorbed and the texture is risotto like. Add another 1/4 cup of wine if necessary – you should be able to smell it. Once cooked, remove the thyme stalks and stir in the truffle oil for extra richness, season and serve immediately.